Is Commercial Baby Rice Cereal Truly Necessary? When I took Sofía (my oldest daughter who is now 2) to her six month well child checkup, I let her pediatrician know that we had started solids and I was still breastfeeding. He told me that I should give her commercial rice cereal as well, but he didn’t back up his reasoning. I had already made up my mind long before that that I would give her simple fruit and veggie purees before giving her rice cereal. About a month after she had started eating those purees, I decided to buy a box of rice cereal. I felt like maybe I was doing something wrong if I didn’t follow my pediatrician’s advice. I also heard from other moms that they were feeding their babies rice cereal. Since then, I have become more educated on the topic. I am currently feeding my second daughter who is 9 months old, and I haven’t given her rice cereal at all. And I don’t plan on ever giving it to her. I don’t understand why pediatricians still recommend commercial rice cereal. Before I knew much about this cereal, I just didn’t think it would be a good start for my own baby. I was raised on a lot of packaged foods, and I know that they really aren’t the best choice for anybody. All of these reasons come straight from Dr. Alan Greene’s e-book (referenced below). My baby can get iron from other foods and/or breastmilk (Greene, p.8). 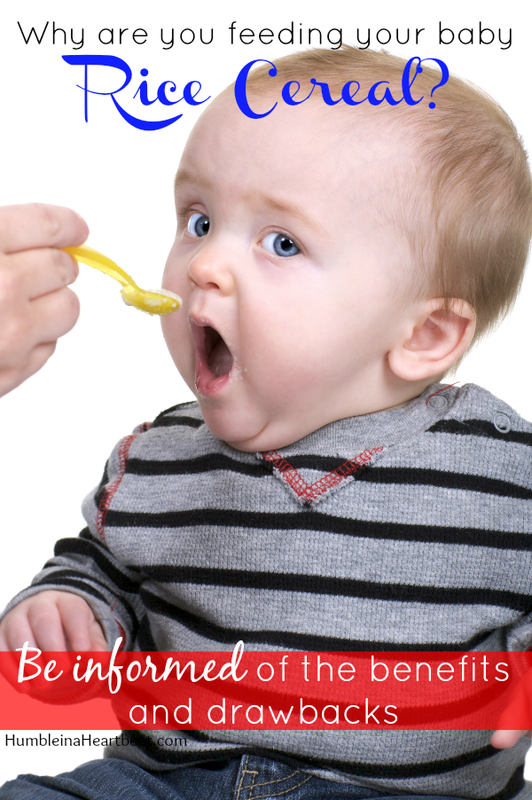 There are plenty of foods you can give baby that do not pose an allergy threat as the first food. 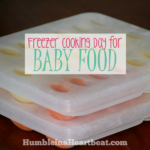 Check out THIS post for what I fed my baby the first month when she started solids. Plenty of cultures introduce spices to their babies from an early age. I want my baby to taste the variety of real food, not the bland and boring taste of commercial food. I puree all of her food so it’s easy to digest. Maybe rice cereal is easily digested, but Dr. Greene sees this as a problem since the cereal almost instantly becomes glucose (Greene, p.4). 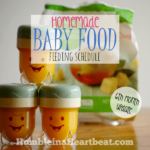 I’ve been keeping track of the cost to feed my baby, and it’s cheaper to give my baby most produce than commercial rice cereal. 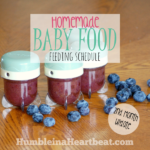 My babies both slept just fine through the night before I ever introduced any solids to them. Rice cereal is nothing but convenient and is actually bad for babies in the long run. Diabetes and obesity have both been linked to this first food (Greene, p.1). If you want to know more about the negative effects of rice cereal, I highly suggest you read Dr. Greene’s paper. The other sources I’ve listed below will also be very helpful. I’ve referenced Dr. Greene a lot in this post because he seems to be the only source of information for this. He must be the only doctor who is passionate enough about the subject to publish information on it. Instead of giving my baby rice cereal from the box, I prefer to buy a bag of rice (I buy brown rice) and put it in the blender or food processor for a few minutes until it turns into a fine powder. It might be more of a process than making the commercial rice cereal, but I can tell you that it’s a lot cheaper and a lot healthier. What are your thoughts on rice cereal? 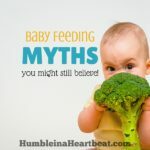 6 Startling Myths About Feeding Babies – Debunked! We are about to start W on rice cereal, when he’s 4 months. Someone gave us regular and brown rice cereal. When did you start feeding the girls solid food? I’ve read 6 months but rice cereal at 4 months is okay. Hey Mallory! I gave Sofia her first puree about a week before she was 6 months and Bella right when she turned 6 months. That was just my preference. I have read that feeding them too early can lead to health problems down the road, and I also didn’t think either of them were ready for food at 4 months. I can’t believe he’s already going on 4 months! Yep! He’s almost four months! He’s a hungry little guy, when he sleeps all night he eats twice within his first 3-4 hours up. I haven’t quite figured out how to get him to not be sooooo hungry. When he is hungry he hulks out red and sweats like crazy!! And he’s skinny too, long and skinny. That’s a couple of reasons we have been debating cereal. I can’t remember my nephew liking or eating cereal though. Making your own is a good idea too! He sounds like a great eater who just needs to grow! Haha. I would say to go with your instincts, because mama always knows best! Since you work, it might be the best option to start him on rice cereal so he doesn’t get crazy mad. Making your own really is so simple and cheap! Good luck, Mallory! Alright update, W hates rice cereal!!!! Doctor told us to start cause he is underweight. Since I was given different kinds for ‘supported sitters’, we gave him oatmeal cereal, that he loves. Well, there you have it. Rice cereal is no bueno. Ha! We don’t have rice cereal here in Croatia. So with Mateo it has been mostly fruits and veggies I prepared myself and I think I started him off with fruits when he was around 5 months or so at the recommendation of his pediatrician. With Lesley it has been fruits and veggies and I think we used maybe a grand total of one box of rice cereal with her. It must be an American thing then. I went through probably two boxes with Sofía. To me, it only makes sense to start them on produce. I totally disagree with the idea that rice cereal will help your baby sleep through the night. I’ve read from many sources that this is simply not true. My son slept through the night well before introduction of solids. I didn’t want in introduce rice cereal but I ended up trying at 6 months, and my son wouldn’t eat it. He didn’t want it. I took more of a baby led weaning approach. I did try purees but my son wasn’t into it for whatever reason. I think it’s really an overrated product. If you want to use it or you don’t there is no right or wrong; however, if you don’t want to do it, I don’t think your baby will miss a thing. Of course I should have mentioned the fact that there are other viable ways to help your baby sleep through the night. I totally agree that it’s overrated. I currently give Bella the rice cereal I make her only about twice a week. Thanks for your input, Lauren! I gave my teenagers rice cereal I believe at 3 months upon dr recommendation. Learned more by the time I had my now 4 and 5 year olds and we skipped the cereal. I think that cereal really only caused constipation for my oldest and had no benefit at all. I wish I had known with them what I learned with my littler ones! That is too funny! I have never seen it spelled like that, but it is beautiful either way. So he was a great sleeper, huh? I have never believed that giving a baby rice cereal contributes to sleeping better. I never liked giving my babies rice cereal but did it because the doc told me to. Now that I’m older and wiser I do what my momma heart says instead of following doc advice! Wish I would have been a braver young momma! I like this post a lot! Thank you, Chels! I definitely feel more pressure when the doctor gives “advice,” but I think doing what you feel is best for your baby should take precedence. I felt the same way about rice cereal as you say, but now I hear about arsenic in rice.. so I may just leave it out altogether. For sure there are always going to be good and bad for both sides. Thanks for bringing that up! At 4.5 months my daughter was definitely ready for solid foods. We started her with carrots and a after starting purees she just blossomed. Meal time was so much fun because she genuinely loves food, all of it, I haven’t found anything she won’t eat. I feel like starting them on rice cereal is doing them such a disservice. Why start them on mushy bland goop rather than something with some actual taste? I feel like the arguments for rice cereal are very outdated and just pushed mainly due to tradition and the big baby food companies (if you haven’t noticed prepackaged baby food is a huuuge industry). Our generation is doing a better job of asking WHY when it comes to our children’s health and what goes in and on their bodies. Isn’t that so true, Annie? 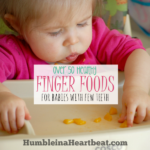 Pediatricians have no incentive to push healthy produce or protein for first foods! I wish that all doctors would just be motivated to improve our health rather than to increase their bottom line. Glad to hear your daughter loves food! My pediatrician actually okayed rice cereal at 8weeks to be mixed in her bottle due to acid reflux. It did help but I’ve only done it once or twice since she’s primarily breast fed, and neither time did she sleep any longer. I’ve never heard of it being recommended earlier than 4 months, but I would strongly suggest that you go with your own motherly instinct on this one. 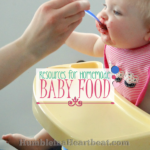 Are there other ways to help acid reflux in babies? This may sound like a silly question, but when you use your own brown rice you just blend up raw rice? Or do you cook it at all first? Thank you. Yes, you blend it raw.